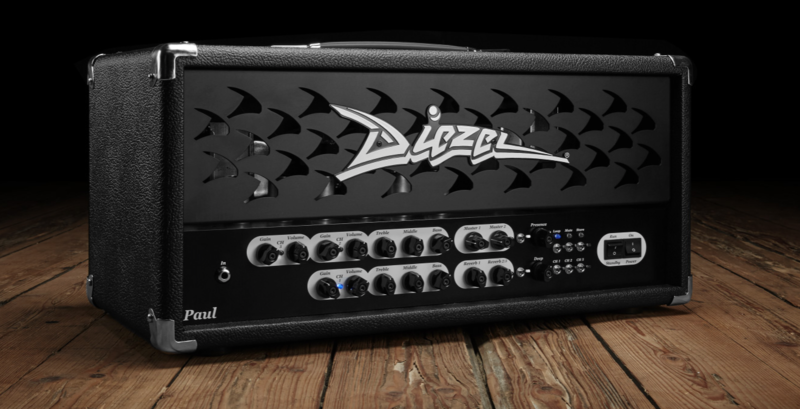 The Diezel Paul is a 45-watt head that delivers sparkling cleans to great dirty sounds paired added by a singing lead channel from a pair of JJ KT-77 output tubes and six 12AX7 preamp tubes. Features include three midi-switchable preamp sections (“clean”, “crunch” and “drive”), a MIDI-controllable reverb, MIDI-controlled FX loops (series and parallel) and much more. The classic Diezel tone is present and accounted for. The Paul reacts fast to the touch, but with a smooth, even touch. 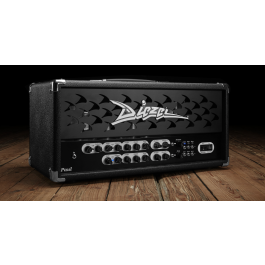 Its exceptional dynamic response lets your guitar broadcast its true personality with clarity and “air.” Diezel amps are revered for their expansive, “open” character that allows the player to explore a myriad of musical sounds and styles. Make no mistake – this is not a “faceless” amp – it’s simply capable of stunningly versatile performance. CH 1 / The “Clean” channel is crystal clean for most of its range, but offers just a bit of compression and overdrive when the gain control is maxed. This is a huge, sparkly-yet- warm-sounding clean channel, at home comping jazz chords or squeezing out funk rhythms. CH 2 / The crunch channel has a natural, robust quality – think Texas blues to heavy rock rhythm to smooth medium-to-high gain solo sounds. CH 3 / The “Drive” channelstarts at a heavy saturated rhythm sound to fully-realized blazing lead tones. Nice and creamy when you roll back the guitars tone knob a little, but brutal when you crank it all the way up. Reverb / The Paul boasts a reverb with independent level adjust for channel 1 and channels 2/3 . The Paul’s master section features dual Volume controls, a global Presence knob and a “Deep” control, which offers to boost the low frequencies at 90 Hz. With extensive MIDI control built in, the Paul does not come with a foot switch, as players have wide switching options.